How do we not have this whitespace? 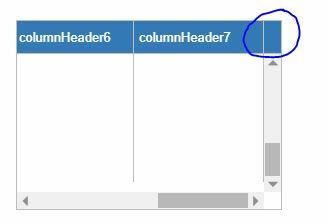 It should be the color of the column header, (blue) ideally. It only appears when there is a vertical scrollbar. With Wisej 2.0.13 it looks like in attached image. 1.5.49 currently. that looks a lot better. Do you have a custom theme or missing updates in the theme? Did you test it with latest release of 1.5 (1.5.56)? I couldn’t also reproduce it with 1.5.56.20 (dev build). Yes, I forked the Blue-1 theme in October 2017 because I needed to make custom modifications. Have there been extensive changes since then? Is there hope of reconciling the 2 versions?